Wintriss Controls Group offers a complete line of die protection sensors for in-die use. These sensors are rugged, shock resistant, and sealed against the environment. Sensors are available to detect everything from end of coil, to misfeed, to part ejection. Inductive proximity sensors can detect, without physical contact, the presence of a metallic object. When power is applied to the sensor, an invisible sensing field emanates from the face of the sensor. A metallic object entering this field is detected by the sensor. 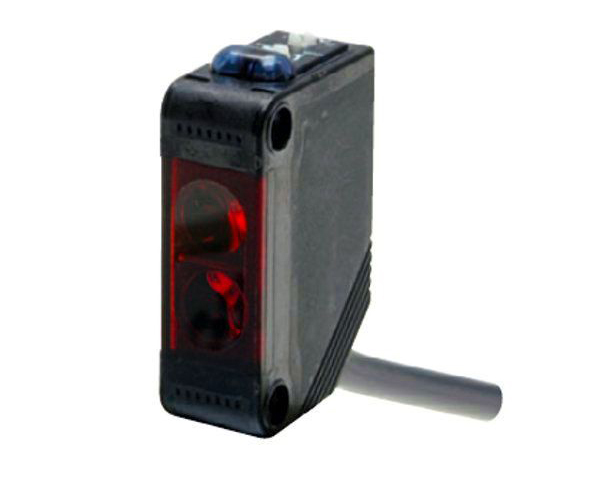 The proximity sensors offered by Wintriss Controls Group are excellent sensors for in-die use. Sensing ranges and operating characteristics are unaffected by lubricants and other non-metallic contaminants. In addition, proximity sensors are the most accurate sensors commonly used for die protection. With trip-point repeatability as small as 0.0004 in (0.01 mm), they are more than accurate enough for detecting die malfunctions. Wintriss offers proximity sensors in two sizes - 8mm diameter (with a 0.060" sensing range) and 12mm diameter (with a 0.100" sensing range). 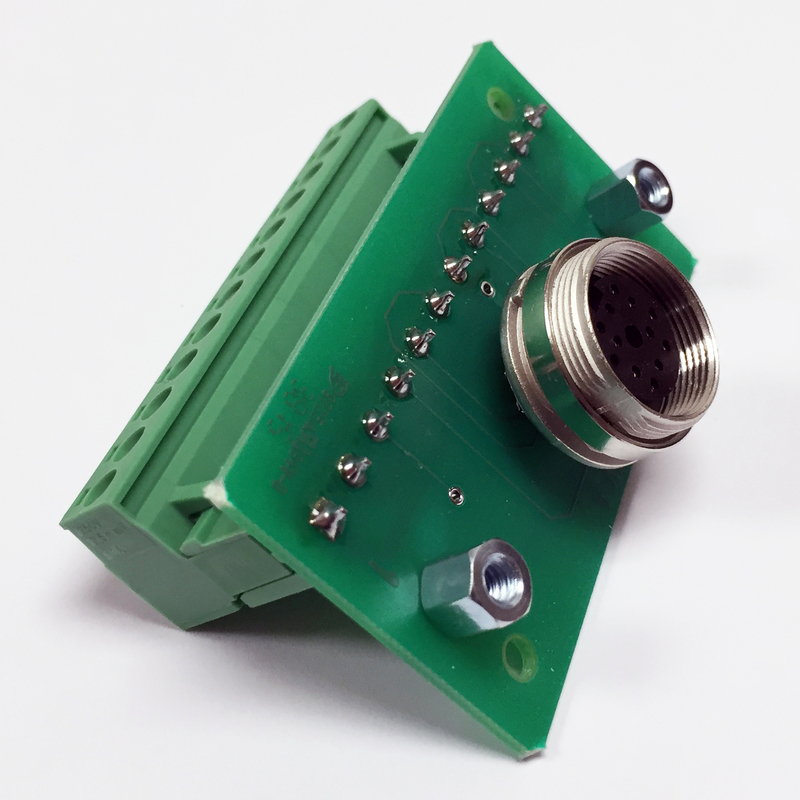 They are available with connectors (to plug directly into the DSI2) or without (for use with the QDP or HD-19 kits described below). 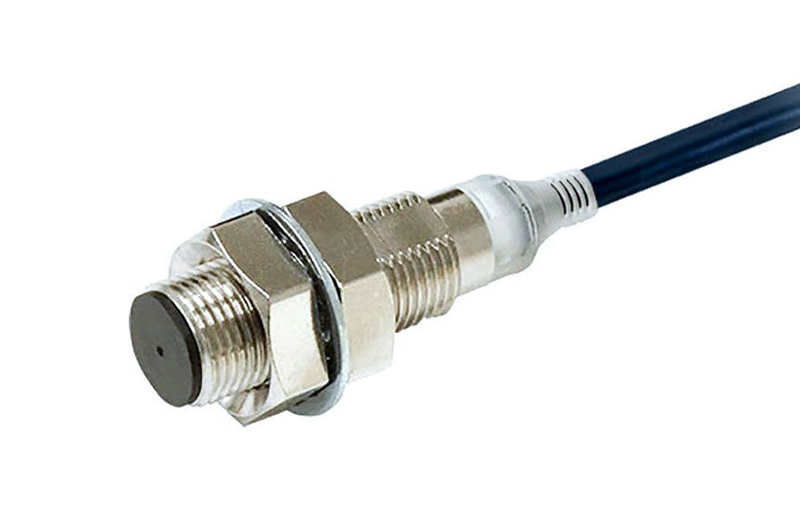 Proximity sensors with connectors are available wired for either normally open (N/O) or normally closed (N/C) operation. 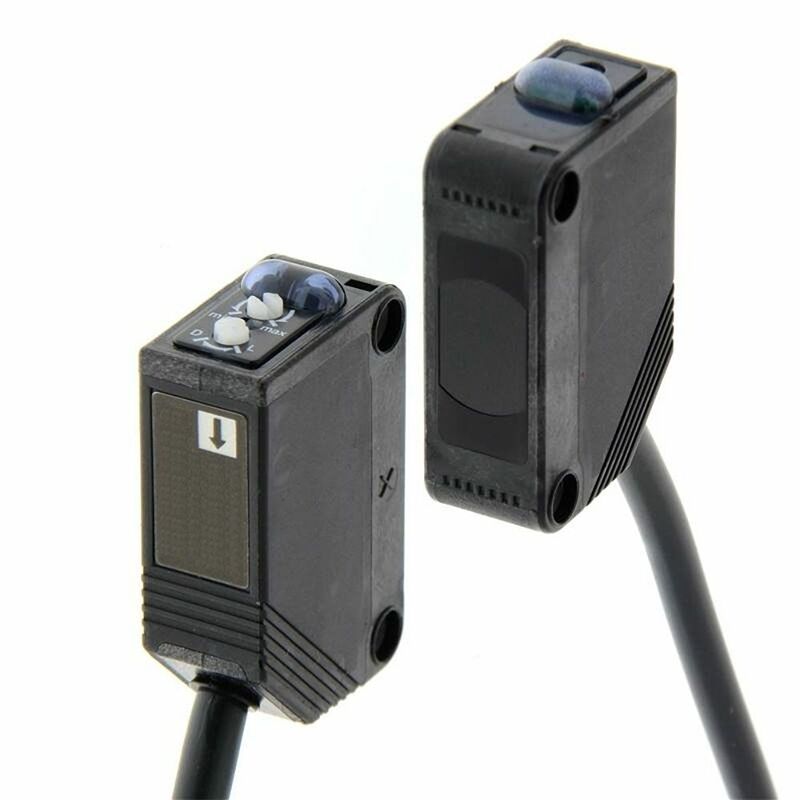 Photosensors consist of an emitter and receiver in either separate housings (through-beam photosensors) or in a common housing (reflective photosensors). The emitter converts electrical energy into light; the receiver detects the light from the emitter and sends an electrical signal to the die protection control. Sensors have built-in cross-talk prevention that allows sensors to be installed next to each other without mutual interference. The through-Beam photosensor is a general-purpose photosensor with a separate emitter and receiver. The CX-411 has a long range, 32 ft (10 m). When this sensor is installed with the emitter and receiver less than 32 ft apart, the unused range (also called the “excess gain”) provides enough power to enable the sensor to shine right through lubricant and other contaminants. The CX-411 has a switch to select light-on or dark-on operating mode. Use the dark-on (beam break) mode for detecting part or slug ejection, or shortfeed. Use the light-on (beam make) mode for detecting a hole in the strip. The CX-411 uses a visible red beam for easy alignment. 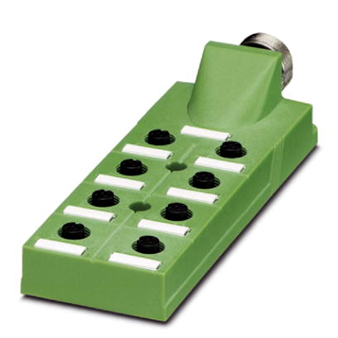 An optional aperture kit with two apertures (one for the emitter and one for the receiver) is available for use in tight clearance applications such as slug detection, or when a more precise beam is required to detect smaller parts or features. Diffuse Reflective Sensors are primarily used to detect part ejection. These sensors are extra sensitive, so they can be used for detecting small, fast-moving parts. Care should be taken when installing diffuse reflective sensors to ensure that background objects do not cause accidental actuation. Use the short-ranged CX- 421 for applications where the part passes close to the sensor and where maximum background suppression is required. Use the longer range PZ-41 for general part ejection detection. Both sensors use infrared light to minimize false actuations caused by oil in the sensing field. 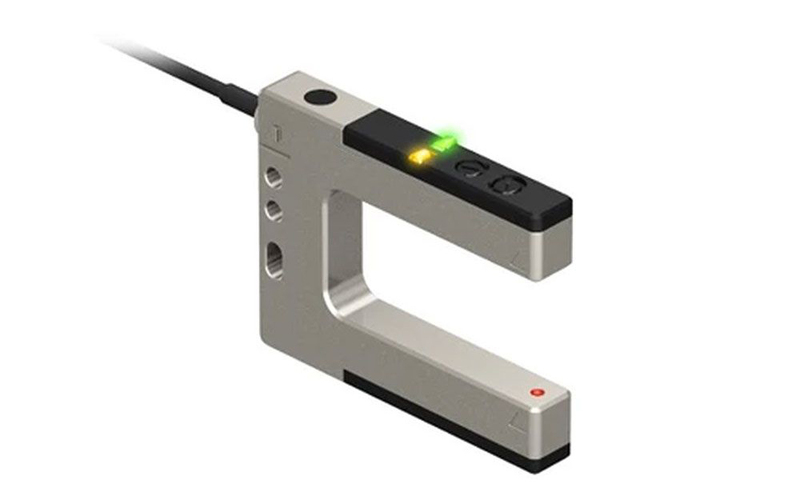 A Photoelectric Fork Sensor is a through-beam photosensor with a prealigned emitter and receiver permanently housed in a U-shaped cast metal case. The sensor’s resemblance to a tuning fork gives it its name. Used primarily for short-feed detection, the RT-610-50 is typically installed at the end of the die to detect either a hole or the edge of the strip. The RT-610-50 is available in a light-on version for hole detection, a dark-on version for edge detection, and without a connector for use with the HD19 or QDP kits. A fiberoptic sensor is made up of a light source and a fiber. The light source contains the emitter and receiver as well as a sensitivity adjustment and light-on/dark-on selector switch. The fiberoptic fiber(s) attach to the light source via a convenient cam-lock mechanism. Fiberoptic sensors are offered in two configurations: opposed and reflective. Wintriss Controls Group uses 1 meter through-beam and reflective armored fibers. A stainless steel flexible jacket protects the fibers from premature breakage due to daily wear and tear that is often found in a stamping environment. 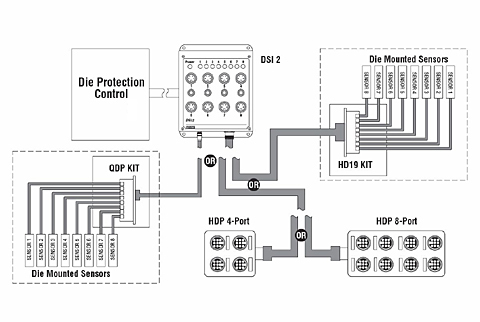 The HD19 Kit enables you to connect up to eight die-mounted sensors to your DiPro Sensor Interface with one heavy duty cable, reducing setup time and virtually eliminating sensor wiring errors during setup. The HD19 kit also helps to extend sensor life by eliminating the number-one cause of sensor failure: damaged cables. When die-mounted sensors have to be plugged into a press-mounted interface box, it is necessary to keep long sensor cables coiled up on the die. Often, these cables are damaged while the die is being handled. With the HD19 Kit, the main cable stays with the press, and sensor cables on the die are kept as short as possible. The HD19 Kit is designed to be installed in a user-supplied, die-mounted enclosure. The kit consists of a circuit board with a 19-pin heavy-duty M23 connector on one side and a terminal strip with removable connector on the other side. Cables are available in three lengths and must be ordered separately. For added convenience and simplicity, another option is the HDP (Heavy Duty Plug). This is a hermetically sealed junction box that can be mounted directly on or near the die without the need for a PC board or enclosure. It’s available in either a 4 or 8 port configuration and can only be used with HD19 cables. It connects to the DSI-2 through a 19-pin M23 connector. Sensors plug directly into the HDP using either a straight or 90- degree mating connector. 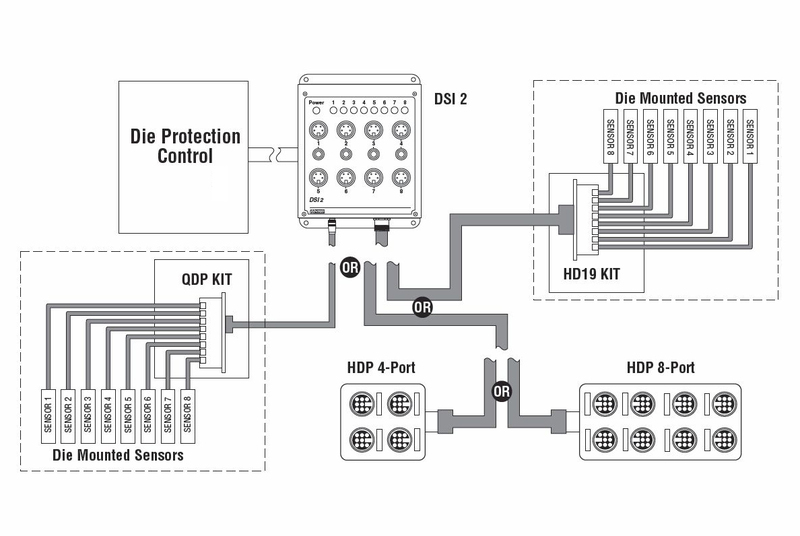 The QDP Kit functions like the HD19 Kit, except its cables and connectors are not as heavy duty. It’s ideal for applications where cost is a factor or when die changes are less frequent and activity around the press or die is limited. The QDP Kit consists of a PC board, 12-pin connector and removable terminal strip. 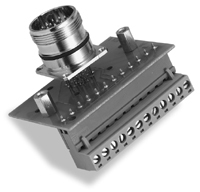 It is designed to be mounted in a user-supplied die-mounted enclosure. QDP Cables are available in three lengths (5', 10', and 15'), and must be ordered separately. For added convenience and simplicity, another option is the HDP (Heavy Duty Plug). This is a hermetically sealed junction box that can be mounted directly on or near the die without the need for a PC board or enclosure. It’s available in either a 4 or 8 port configuration and can only be used with HD19 cables. Sensors plug directly into the HDP using either a straight or 90° mating connector.